Usually I don’t read until I found interesting and useful. But some days ago I read a story written by eminent Marathi writer Madhukar Toradmal. Title of that story looked very different and interesting, “Gandhivadh Aani Mi”. Its in Marathi. Gandhivadh means “Assassination of Mohandas K. Gandhi”. But vadh word in Marathi tells assassination of bad person. I was amazed. Title in English is “Assassination of Mohandas K. Gandhi and I”. I found that story is very interesting to read. And from that title I am surely getting some useful information out of this. Then I start reading. As story progresses one thing came in my mind that after independence we Indians entered into other battle. First battle was against British’s and next battle started against religious hatred. After reading a whole story I came to the conclusion that what is happening today in India is due to mistakes made by Congress politician like M.K. Gandhi and India’s first prime minister Jawaharlal Nehru after we got independence. And about trusting the writers story, Madhukar Toradmal ji has written numerous famous books including comic dramas, epics. That justifies the trusting the content of that story. This story is real story. In that Madhukar ji has interviewed Vishnupant Karkare who helped assassin of M.K. Gandhi, his name is Nathuram Godse. Vishnupant Karkare elaborated reason to kill M.K. Gandhi to Madhukar ji. He told how they killed M.K. Gandhi, when and what preparation they did for great assassination. He told that Gandhi’s assassination was all necessary to save Indian people from further violence with Pakistan. But after assassination Gandhi become superstar who live and died for India. Vishnupant Karkare also told that last word said by Gandhiji was also fake. Gandhi was not able to open his mouth after firing from only 2 feet distance. Gandhi died on the spot without opening lips. Also Nathuram Godse was not insane to kill 80 years old man, he did only to save Indians from hatred. Gadhi first ordered Indian government to donate 55 crores to Pakistan to help then build their democratic country. After that as Pakistan rudely killing many hindus migrating from Pakistan to India Gandhi said “Pakistanis are our brothers, we do not have to give fight back against their violence, we are non-violent, we will take another birth to build our nation”. In that period Gandhi’s fast was against hindus communities. His decision was totally against hindus and many Indians came from Pakistan after migration. Then Nathuram Godse, Vishnupant Karkare, Nana Aapte and Gopal Godse decided to kill Gandhi and they did it. Nathuram Godse and Nana Aapte hanged till death and Gopal Godse and Vishnupant Karkare got life prison jail. There was lot of real incidents and dialogs written in that story. 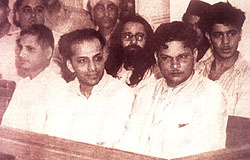 In that court case Vinayak Damodar Savarkar was also named as guilty but Indian government failed to prove. I am now understanding that issues with Pakistan are stared by these old congressmans and now these are getting even tough to solve. What bad is now happening in India like terrorist attack, corruption hindu-muslim fight and all is because of big mistakes made by great congressmans M.K. Gandhi and Jawaharlal Nehru. And for this situation Congress Government is all responsible from root. couldn't agree with you more.... just my views being expressed!!! !